The Greeks and Romans used warmed seawater as a therapy to cleanse, heal and relax. Thalassa is the Greek word for sea, hence, thalassotherapy. I use thalassotherapy, in this case an Aromatic Salt Bath, to sooth my muscles after a workout, nourish my skin during a dry winter and ease me out of the day and into bed. Salts deeply cleanse, relieve dry and itchy skin, balance oily skin and cure conditions like acne, eczema and psoriasis. 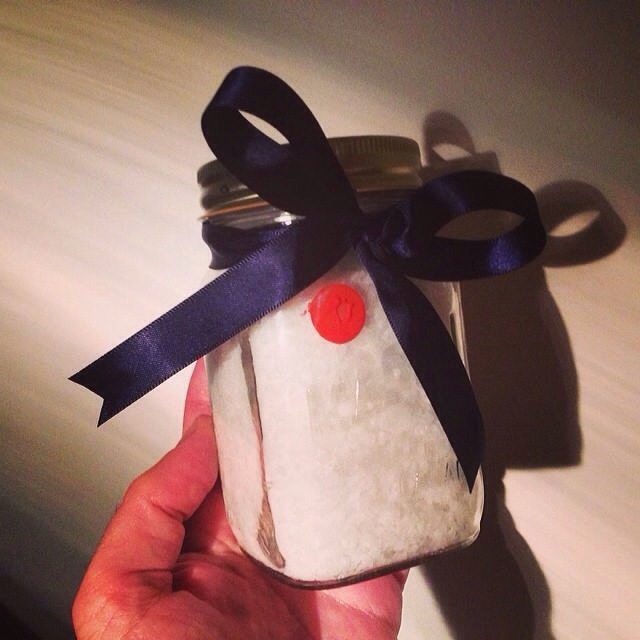 Salts facilitate healing by opening pores, hydrating and improving circulation in our tissues. Salts contain sulfur, magnesium, potassium and calcium – all of which support tissue cells. I prefer Epsom salts for aches, pains and inflammation. Visit our Aromatherapy page for more information on how essential oils can help you. 1) In a glass jar or glass bowl, add a quarter cup of sea, Epsom or Himalayan salt (you get at your local natural food shop or pharmacy), add 5-10 drops of your bespoke Olistika Oil Blend or any organic pure essential oil or pure oil blend. 2) Pour your Aromatic Salt under the running water, swishing for a moment to dissolve the sale, as the tub fills. 3) Once your tub is filled to your liking with comfortably warm water, enter your Aromatic Salt Bath. Enjoy for no more than 20 minutes, inhaling the essential oils as they evaporate, massaging the oils into your skin and thinking happy thoughts – like the things you’re grateful for. Which essential oil is for me? Contact me at info@olistika.ca with your questions and for more information. Here is more information about one of my favourites, Lavender Oil. Add ½ cup of baking soda and/or 1 teaspoon of borax to the above salt and essential oil mixture. If you’re ok with a few leaves in your bath, add two tablespoons of your favourite herbal tea or three bags of your favourite herbal tea to the above. Make your Aromatic Salt in bulk by making and storing it in a glass jar. That would be, one cup of salt in the jar and 20-40 drops of essential oil added on top. Place the cap on the jar, shake to mix. Enjoy ¼ cup in each bath, keep sealed and use within 3 months. Also makes a thoughtful and quick homemade gift. I always recommend rinsing your tub after bathing.